At first light the Balinese shaman begins his dangerous ascent of Mt Agung. His mission is to offer prayers of atonement to the angry Gods that reign over Bali and its people. By the time he reaches its summit, some 3,000 meters later, Agung is grumbling loudly. The sound is deafening. Sensing their great displeasure, and an imminent eruption; the elderly shaman performs the customary and ageless rites then beats a hasty retreat. He's very wary of these Gods and well remembers how in 1963 over 1,500 local inhabitants perished by their fiery wrath. Such shamans are not uncommon hereabout and there are currently 129 active volcanoes in Indonesia. Meanwhile, some 3,000 kilometres to the west I am holidaying - enjoying the peace and tranquillity by Lake Toba in northern Sumatra, Indonesia. It's my second long-term visit to this magnificent fresh water lake in as many years. The Lake is 100 kilometres long by 30 kilometres wide and around 900 meters above sea-level. Indonesia, and more particularly Bali, has become my second home these past several years. This day at sunrise I am gazing out over the Lake's peaceful waters, as I would do most mornings. I eventually cast my gaze to the north whereupon I see, to my surprise, an unusual column of cloud, some 30 kilometres across the other side of the lake and rising upwards. I'm astonished and it takes me several minutes to realise this is not just a fluffy white cloud but an erupting volcano. Sitting there, in the half-light, on my lake-side balcony I feel blessed to bear witness to this magnificent and rare spectacle: a darker side of me questions whether this could also be a curse as I soon learn I am witnessing the re-awakening of Mt Sinabung after 400 years of slumber. Both Agung and Sinabung lay within the Pacific Ring of Fire: a deadly ring of volcanic and seismic activity which stretches for over 40,000 kilometres starting at the bottom of New Zealand; then heads north through Vanuatu, New Guinea, across the Indonesian archipelago, north through Japan, all the way to Alaska then turns south along the west coast of Canada, the US and all the way to southern Chile. It is enormous. It's active, hot and is the home to 452 volcanoes (90% of Earth's volcanoes). This essay only refers to the Western regions of the Ring since I've had the great fortune to travel, work and play within these regions over a period of more than five years. It has become my second home. 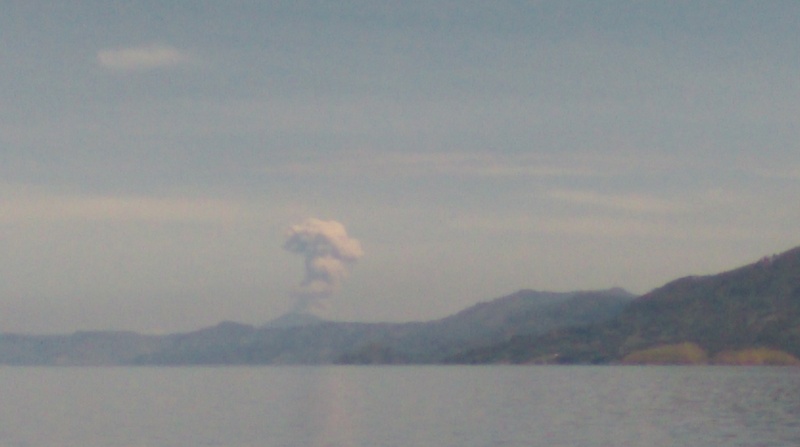 Lake Toba's Mt Sinabung has now caused the evacuation of 30,000 people and on occasions closed the busy international airport near Medan - a city of over 2,000,000 and only 50 kilometres from Mt Sinabung. Newspaper reports are describing bouts of panic amongst some city dwellers. When passing through Medan I was advised that the city was on high earthquake alert. 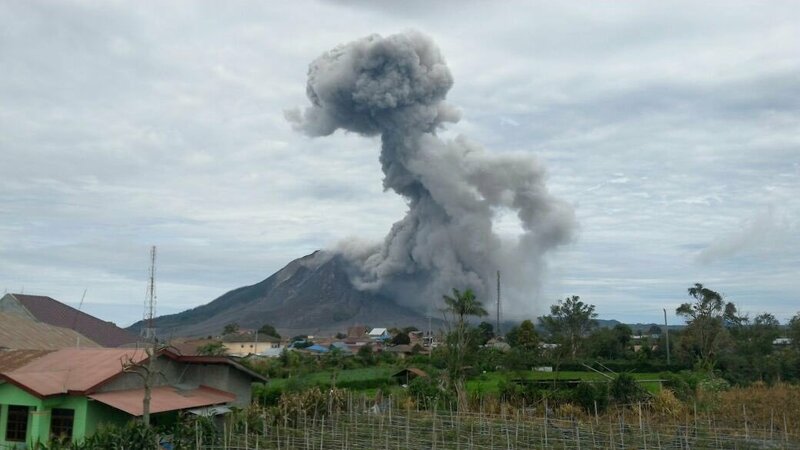 Sinabung is not a large volcano by Indonesian standards but some fear it could be the portent of something more sinister as Lake Toba, adjacent to where the volcano is located, is the world's largest volcanic caldera. It was here 75,000 years ago, when a series of volcanoes exploded creating the massive now-water-filled crater - Lake Tobe. Scientists refer to this event as the Toba Catastrophe as it caused a global volcanic winter lasting 6-10 years; whereupon Earth's temperatures dropped 15 C, and affected global temperatures for a further 1,000 years. Many scientists also believe Earth's population was reduced to around 30,000 people as a result. During the remainder of my three weeks by the Lake, Mt Sinabung was in an ever-growing state of anger and constant eruption, and for those who love a magnificent red sunset, this is the place to be. I was now thinking, 75,000 years ago is ancient history in the overall scheme of things and similar big volcanic events belong to that ancient history. Off the southern end of Sumatra and wedged between it and Java lies a small disfigured island growing in stature at around a meter a month. It's called Anak Krakatoa - Son of Krakatoa. 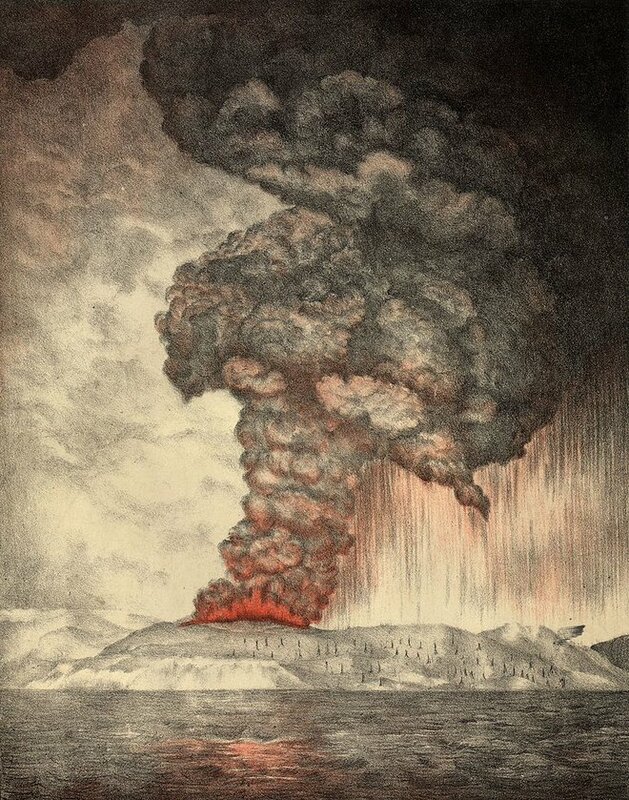 This island was the home of Mt Krakatoa, a super volcano that exploded in 1883 in which 36,000 local people perished. The explosion was equivalent to over 10,000 Hiroshimas and displaced 45 cubic kilometres of debris. The region was cast into total darkness for three days up to 500 kilometres away, and the sound of the explosion was heard in Perth, Western Australia, 3,000 kilometres away. Again global temperatures dropped 1-2 degrees C for five years. The ever-growing Son of Krakatoa is still active and its last major eruption was in 2014. Let's hope it's not a case of Like Father Like Son, or that the Gods of Krakatoa have yet to be appeased. Around 200 kilometres east of Bali's angry Mt Agung lays the Indonesian island of Sumbawa, as yet undiscovered by mass tourism. This beautiful island is the home of Mt Tombora - the world's deadliest volcano. When Tombora exploded in 1815 global temperatures decreased by 5 C and the world experienced a year without summer. Crops failed all over the northern hemisphere resulting in a famine causing the death of well over 100,000 people, as well as the deaths of tens of thousands of local inhabitants. Its eruption is the biggest in recorded history with 150 cubic kilometres of debris being expelled into the atmosphere and surrounding area. Mt Tombora, an active volcano recently upgraded to Code Yellow alert, lies upon the same fault line as all the preceding volcanoes mentioned herein, and commencing in 2011 increasing levels of seismic activity are still being recorded on the mountain. 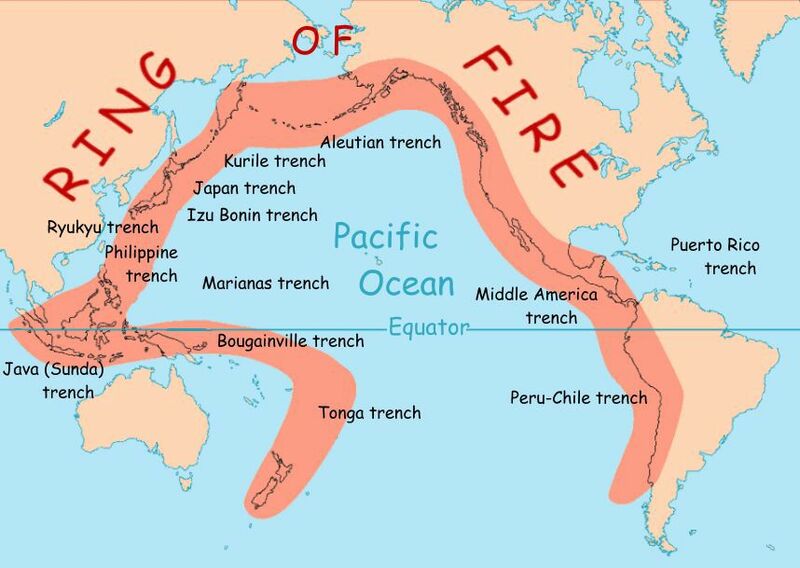 Scientists are exclaiming that the Ring of Fire is now exploding with 32 volcanoes currently erupting with many dozens more showing unrest or minor activity, and several strong earthquakes. In the western regions of the Ring Of Fire (my region) seismologists and volcanologists are openly voicing their concerns at the sudden increase and severity of eruptions and earthquake activity along much of the Ring; from earthquakes in New Zealand, Tonga, Fiji, Samoa and Taiwan, and volcanic eruptions in Vanuatu, New Guinea, Japan and throughout Indonesia. The devastating March 2011 earthquake just off the east coast of Fukushima Prefecture, Japan - the strongest earthquake ever recorded on our planet, caused a deadly tsunami to smash into the east coast of Japan killing around 25,000 people. My son and his family were living and working in far north east Japan, on the edge of the tsunami ravaged area, when it struck and I was there shortly afterwards to assist them with various needy matters. I visited the tsunami coast and the images of the devastation that I witnessed first-hand will remain with me forever. Consequently, I have a deep respect for the awesome power of the forces of nature. Japan is home to 110 active volcanoes which is extraordinary since it's such a small country. Since their deadly 2011 earthquake and tsunami, 47 of those 110 active volcanoes have unexpectedly and dramatically increased their volcanic activity and most alarmingly Mt Fuji, Japan's most sacred mountain and home of the highest level Gods, is rumbling so loudly that its status has been upgraded to critical, after 300 years of slumber - It's primed to spew - say scientist. It's a mere 50 kilometres from Tokyo's suburbs. Some are saying the Gods here are angry because Japan, being at the juncture of four major tectonic plates has the highest ratio of nuclear power plants for such a small-sized nation anywhere on our planet. The nation is also crisscrossed with uncountable minor fault lines. Japan has 54 nuclear power plants with 6 of them sited upon the tsunami coast mostly centring Fukushima: what could possibly go wrong? A simple Google search will reveal this information and the concerns and recordings of scientists. So, what's up with the Gods lately? I do not claim to be able to read Godly minds and know what the Gods are up to lately, so I will leave that doubtful task to those with a more heightened sense of importance; or arrogance. But my recent experiences and research have certainly given me much to ponder. Because of these experiences and my extensive travels through various regions within the Fiery Ring, I have come to realise it is these very same forces of nature - call them Gods if you must, that both create and influence much of life here on planet Earth. But just as those Gods giveth life so too those Gods can taketh it away.